Fixation of soft tissue to bone is a basic technique in orthopaedic surgery. Historically, this involved the use of transosseous tunnels through which soft tissue structures were fixed using sutures. 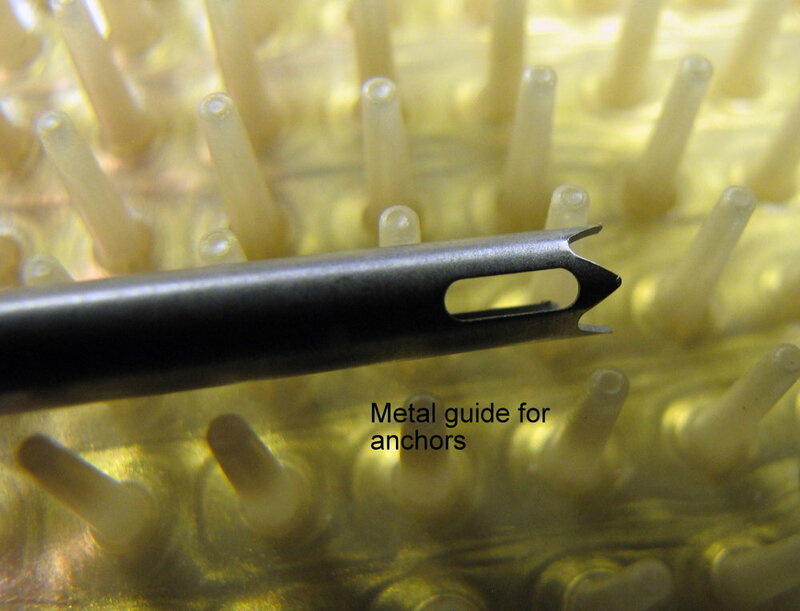 This time honoured technique is now increasingly being replaced by use of 'suture anchors', and 'interference' screws which provide faster fixation with high strength, often without the need for extensive surgical exposure. The 'eye' - a mechanism to hold the suture. While an 'eye' in the anchor material is still common, other methods use a loop of suture, a bridge of material and so on. These are types of plastics, composed of a small repeating unit that can be utilised in orthopaedics for their properties. 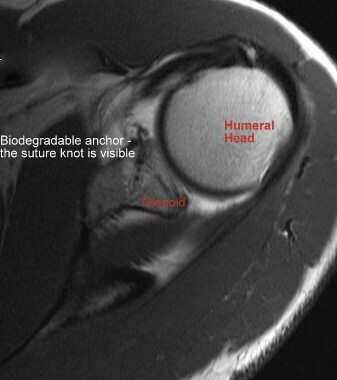 Polymers will usually not interfere with postoperative imaging. Revision surgery is easier as these either resorbs or can be treated like surrounding bone, i.e. drilled through. An example is PLLA, a homopolymer of poly-L-lactide. They can cause an inflammatory response and produce cystic changes around them as they are absorbed. The complete process of absorption takes over 5 years, possibly upto 10 1.This does not form bone but a type of fibrous tissue that is partially calcified is visible. Hunt J, Callaghan J. Polymer-hydroxyapatite composite versus polymer interference screws in anterior cruciate ligament reconstruction in a large animal model. Knee surgery, sports traumatology. Arthroscopy 2008;16:655-660. Ruhe PQ, Hedberg EL, Padron NT, Spauwen PH, Jansen JA, Mikos AG. Biocompatibility and degradation of poly(DLlactic- co-glycolic acid)/calcium phosphate cement composites. J Biomed Mater Res A 2005;74:533-544.